Heavy gauge thermoforming from Gregstrom Corporation turns large, thick plastic sheets into high-quality plastic parts and products. Gregstrom supports sheet sizes up to 60” x 120” (.040”-.500” thick). With sheet sizes that are larger than most of our regional competitors can handle, Gregstrom’s heavy gauge thermoforming services are also diverse. We can match colors based on chips or samples, create thermoformed parts from various plastic materials, and meet the demands of your sales forecasts. Ask us about custom color matching and textured tooling. Gregstrom forms custom thermoformed parts from plastics such as ABS, acrylic/PVC, HIPS, HDPE, LDPE, PP, PETG, and polycarbonate. Ask us how textured tooling and plastic sheets in custom colors can eliminate the need for painting parts. Gregstrom Corporation provides three type of heavy-gauge thermoforming services. Vacuum forming supports quick start-ups and efficient prototyping. Pressure forming creates sharp, crisp lines and details; textured surfaces; and formed-in undercuts. Zero degree draft on sidewalls is possible. Twin sheet forming produces hollow parts with details on both sides. Twin sheet parts are strong and lightweight, and can consist of dissimilar materials. Gregstrom’s heavy gauge thermoforming equipment includes shuttle machines and three- and four-station rotaries. 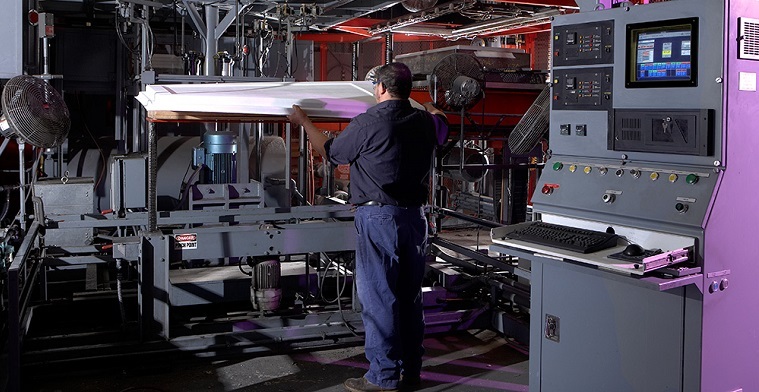 Shuttle machines process one sheet at a time (single sheet thermoforming) and are ideal for lower-volume production runs. Three- and four-station rotaries can hold multiple sheets (twin sheet thermoforming) and are faster and more cost-effective for higher-volume runs. So whether you need quick-turn prototypes or low, medium, or high-volume production runs, Gregstrom can create the heavy-gauge thermoformed parts that you need. Custom thermoforming from Gregstrom provides lower tooling costs and shorter lead times than injection molding. In addition to machined and cast aluminum, thermoforming tools can be made of wood, epoxy, and other low-cost materials. Tool modifications are cost-effective, and on-the-fly changes support prototyping, short runs, and medium-volume production. Thermoformed parts don’t exhibit the porosity, sink/gate marks, and other undesirable surface conditions that are common to other production processes. Instead, heavy gauge thermoforming provides a blemish-free finish along with fine details. For nearly 70 years, Gregstrom Corporation has been forming and molding plastics at our Made in the USA manufacturing facilities in Massachusetts. To learn how our thermoforming services can support your application, contact us online or call (781) 935-6600.